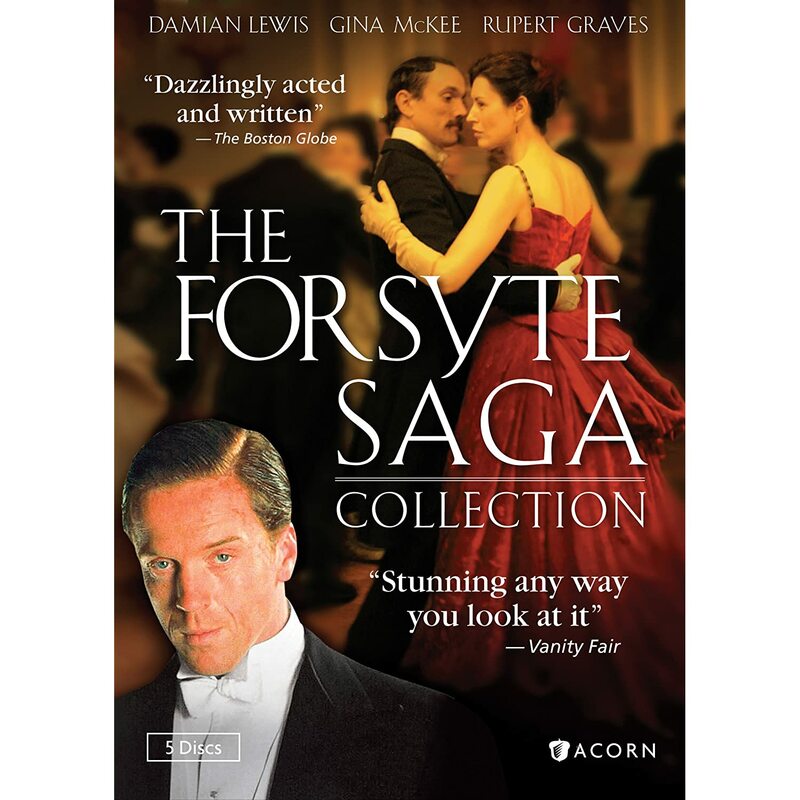 Acorn Media has just released The Forsyte Saga Collection, a five-DVD set which contains both series of the acclaimed British production. The programs have been available separately for a while now, but this is the first time they have been packaged together for the US market. The series is adapted from the trilogy of novels by John Galsworthy, which were published between 1906-1921. The books have rightfully taken their place as classics of British writing. In fact, they were initially adapted for television way back in 1967, by the BBC. As I have never seen that version, I cannot comment on it. But I can say without trepidation that this Granada Television / ITV Network production is superb. For those who are unfamiliar with the basic story, I will try and briefly summarize the plot. The Forsyte Saga tells the tale of the Forsyte family, from the Victorian era all the way up to the early 1920s. The proper phrase for this is “multi-generational.” What the show really centers around though is Soames Forstye (Damian Lewis). Soames is a man to whom the phrase “born with a silver spoon in his mouth” could not be more appropriate. In the rigid class system of Victorian England, wealth meant respectability, and responsibility, whether one liked it or not. Soames is tragically aware of this, and is challenged one way or another by friends, family, and foes in this regard. Programs like The Forsyte Saga are often called “costume dramas,” and nobody does a better job with them than the Brits. These are the type of stories which involve a great deal of emotional investment from the viewer, but the payoff is well worth it. In the best ones, I find myself wishing they would never end. I am speaking of such classics as Brideshead Revisited and Upstairs, Downstairs, just to name a couple of famous examples. The Forsyte Saga clearly belongs in such exalted company. As previously stated, the story is laid out for us in a broad and sumptuous manner. When watching this set, I found myself becoming practically addicted. I had heard plenty about the show before, but had never seen it until now. The full running time is 12 hours, and even the most die-hard fan might find it difficult to watch it all in one sitting. It took me three days, but believe me, I am not complaining. When one is fortunate enough to come across a series made with such integrity to every detail, it is indeed a pleasure to see. The first series spans roughly two decades. Soames marries Irene Heron (Gina McKee), and believes that he has found his soul-mate, and that he has now completed his “perfect” life. Well, not for long. Irene does not love him, and only accepts his proposal (finally) after being pressured by her family. When she begins a rather transparent affair with architect Philip Bosinney (Ioan Gruffudd) all hell breaks loose. Soames is a solicitor (lawyer) and quickly files suit against Bosinney over contract matter, it is out of spite. Soames wins the case, but when he returns home triumphant, Irene has left. There is a great deal more to the story, but I think this is a good place to stop. I actually think I have already given enough away to have maybe put in a “spoiler alert.” The Forsyte Saga is full of twists and turns, and a huge part of the fun is in seeing where the characters will wind up next. One thing it is not, is predictable. It is no surprise at all that Galsworthy’s books have become classics of British literature. The class system is portrayed so perfectly that to a US citizen it almost seems preposterous. Reportedly though, the novels were based (somewhat) on the author’s own life. In any event, although this is a work of fiction, much of it rings very true. Even though the two series were first broadcast 10 years ago, both remain marvelous examples of the best that British television has to offer. As for bonus material, there is a 20-minute “Making Of” segment, photo galleries, John Galsworthy biography and booklist, and cast biographies and bibliographies. The Forsyte Saga Collection is another fantastic entry in that most British of television institutions, the costume drama. It is also an extremely compelling story, told with an enormous sense of style.